Popular tech blog VentureBeat has dropped a lengthy interview with members of the EverQuest II team to retrace how the Isle of Refuge newbie zone and Far Journey boat tutorial were resurrected, and then the ensuing shenanigans as the team tried to maintain the secret even as players stumbled upon more clues that what had once been deemed “impossible” was in fact going to launch just hours later. While it was a team effort, ultimately we have EQ2 designer Carlos “Gninja” Mora to thank for performing archaeology on parts of EQ2 that hadn’t been seen in eight years, and for then recognizing that what at first seemed to be insurmountable roadblocks preventing the zones from running properly could be fixed. 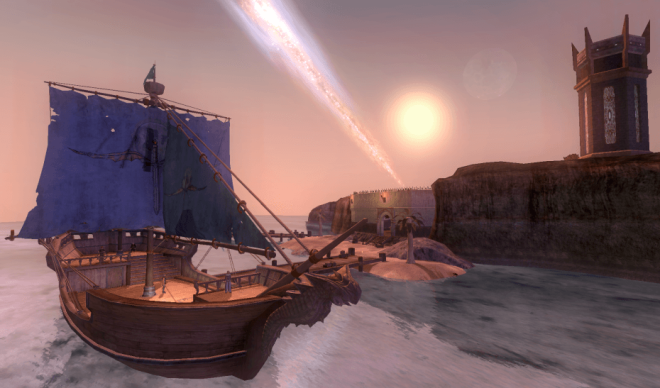 Months of hard work by a dedicated group (most of the EQ2 team has continued working full blast on this fall’s Campansion) led to an overwhelmingly successful launch of two Time-Locked Expansion Servers for PvP and PvE. We’ll never have the game as it was at launch, and how many would truly want that (spirit shards and subcombines anyone? ), however enough changes and limits have been applied that thousands of characters have been created and played on the new TLE servers just in the last few weeks. Game companies don’t often get to play a happy trick on their customers. EverQuest II‘s designers got an idea early in June: They would release two new servers for their free-to-play massively multiplayer online RPG that would only have the original game on them, circa 2004. Players would vote for when the company should open up the game’s expansion packs on those servers. One piece of the game would be missing, presumed lost forever: The starting zone, which consisted of an island and boat ride, could not be recovered. Players were irate, saying this wasn’t nostalgia, this was just two new servers. Continue reading the article which interviewed Holly “Windstalker” Longdale, Kyle “Kander” Vallée, and Carlos “Gninja” Mora. That was an awesome read and insight in to how it all came about. Props to the EQ2 team and Gninja especially, for pulling all of that off, it was criminal that Isle of Refuge was ever removed really. New Halas / Darklight Woods are great and all, nice flow, polished content etc., but to have the choice of still being able to begin your adventures on the Isle is a much better way. And I unashamedly confess that I was one of those that shed a tear or two of nostalgia of my first foray into Norrath mark II back in November 2004. Alright I weeped like a baby for days on end! Whilst SOE / Daybreak as a corporate entity has taken some stick down the years, I’m fairly certain that most of the EQ2 team together with the other teams at Daybreak are committed and passionate about the game they make. The fact that many of the team were players and fans prior to joining the team and indeed still continue to play the game a full decade on from launch is proof of that. There seems to be a good vibe to the team again after the internal upheavals of the last year, a nice family feel again to the team which can only help the game become better and more successful. So Daybreak please nurture that moving forward with the entire EQ franchise. On another note I was delighted to read Holly announce in chat at the weekend that Domino will be returning from her stint on the Landmark team back to the EQ2 fold on a full-time basis. Wonderful news for us EQ2 players and fans, and the tradeskilling community (assuming she’ll be working on tradeskill stuff), but maybe she’ll also be working on other stuff too. Removing the Isle of Refuge was yet another one of Rich Waters design decisions. The list is long. To be fair, it did work it’s way into the storyline, but as with quests, the story line could have still unraveled as people leveled, not just taking the zone out of the game. Starting my “remixed” namesake on Stormhold and finding myself on that ship…it was like coming home. Mad props to the crew who pulled it off. Except you can’t create a character on the TLE servers unless you are paying for a membership (and krono prices have skyrocketed). I was disappointed that they allowed “krono” accounts to play on the TLE servers. I thought that requiring an actual subscription would function as a kind of bozo filter.